Vélo Vogue: Music for our future... powered by YOU! 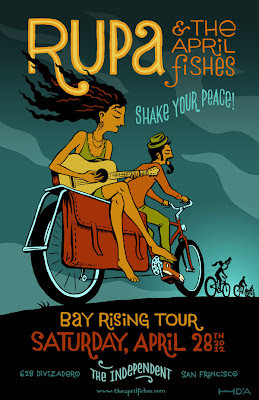 PRI's The World followed Rupa & the April Fishes during a leg of Bay Rising - their bicycle powered music tour of the Bay Area with Shake Your Peace! and Fossil Fool. Catch the story on The World today on KQED from 2-3pm PST, and the music story is usually in the last 10 minutes. You can also listen and see the video on the web at http://www.theworld.org. Your last two chances to participate and help power the concerts are tonight 4/27 at the Sausalito Seahorse and tomorrow 4/28 at The Independent in SF.